Pure rubbiish i thought Johnson deserved a game, and as for the myler comment, well they moan when the national side is made up from top 5-6 clubs but them moan when a player from 9th placed club gets picked. The game being in Hull then you would expect the majority of support to be from there, just because people did not have Leeds shirts on does not mean there was not plenty from leeds. Plus Leeds had the south stand opening and shirt launch with the game in the big screen. Leeds out marketing the RFL as usual. Even if there was a train you wouldn’t get far on a Northern Powerhouse train returning after 10. Yorkshire lads sitting next to us weren’t looking forward to drive home either. And also game was free online no incentive for mid week travel there. Why omit the 23.5k at the KCom in 2015? Also, as asked earlier, where abouts did you sit yesterday? Hopefully due to the England win for game 1 Anfield will be more packed out. No doubt a train strike will be announced for Sunday. So, Leeds had a stand opening event on the same day as a test match? Classic Rugby League issue of lacking goal congruence for short term self gain. So, maybe I was right about lack of Leeds fans ? You may even think that it was a deliberate snub by Leeds to have such an event clashing with an International. And folk are complaining about Trinity fans putting club before country. Both of these crowds are terrible. Neither Leigh or Hull should host an international again. So it's their fault then? Or clever marketing by Leeds aimed at local fans who could not or did not want to physically get over to hull, as the event started at 11.30am any fans could have done both are hull only around 75 mins from headingley. One that did not want to could hang around have a few beers and watch it on the screen. Leeds managed to organise that thing in a brewery that the RFL cannot. 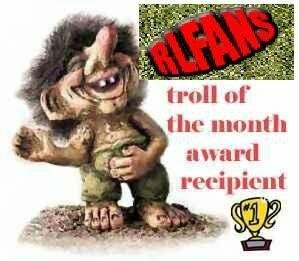 RFL, if you’re reading, give me £35k/year salary and I’ll do your marketing on my own and do a better job than your whole organisation has done for years! I wouldn't take on that job for less than £170,000 PA and I'd also want bonus targets on attendances.......£35,000 PA is a graduates starting salary at a decent London Agency......I suspect that's the problem at the RFL.........they are paying peanuts.